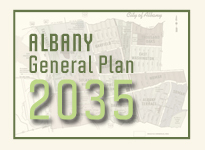 The Planning and Zoning Commission continues to hold monthly study sessions on the General Plan. Sessions are typically held on the fourth Wednesday of the month and are part of the regular Commission meeting agenda. In March 2014, the Commission reviewed the growth assumptions to be used for the General Plan, including household and employment projections for 2035. The April 2014 meeting featured a review of Draft Land Use policies, and the May meeting focused on transportation. Upcoming meetings will be topic-focused, with subjects including conservation, hazards, parks and open space, and community facilities. Each study session includes a period for public comment and feedback.